Bring some elegance and class into your gift giving this year with our Ivory ribbon. Sure to make a lasting impression, this ribbon won't ever go out of style. Having a softer edge than white, this ivory shade will compliment any kind of gift. From weddings to baby showers to birthdays, this ribbon will tie your gift together perfectly (literally and figuratively). The sheer material will give your present a sweet touch, no matter what kind of color you choose for the wrapping paper. Or use this ribbon for other purposes - like those arts & crafts that will make your children super happy, or that DIY blog you have, or even to decorate your desk lamp. Ivory Sheer Ribbon measures 7/8" wide and is 25 yards long. If you love this sheer ribbon, make sure to check out our other colors. 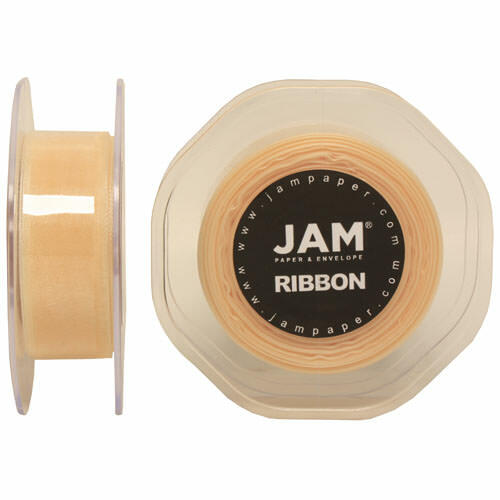 Click 1 inch Sheer Ribbon under "Other JAM'n Products You Might Like" to get a closer look!